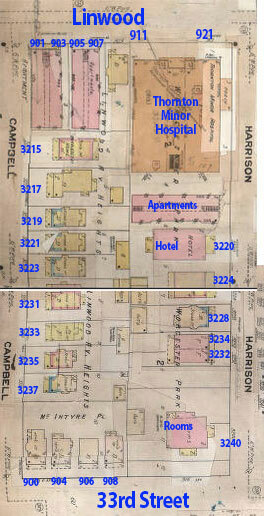 Do you remember the Belmont Hotel and the block of Linwood between Campbell and Harrison? The former Belmont Hotel, vacant since the mid-1980s, has seen variety of uses since it was opened as a hotel in 1912. It is currently set for redevelopment as market-rate apartments. A hulking white building at 911 E. Linwood was in the news this week, with a developer successfully requesting assistance to overhaul it. The building – formerly a hotel, a nursing home and a government headquarters – is now slated to reopen as market-rate apartments in 2017. The block from Linwood to 33rd, from Harrison to Campbell, in a 1909-1950 Sunburn Fire Insurance map.nursing home and a government headquarters – is now slated to reopen as market-rate apartments in 2017. According to the Kansas City Star, developer Ted Sleder says the building is eligible for the National Register of Historic Places. It is by far the largest structure on the south side of Linwood Boulevard in the block between 33rd Street, Campbell and Harrison, the focus of this week’s look back in time. 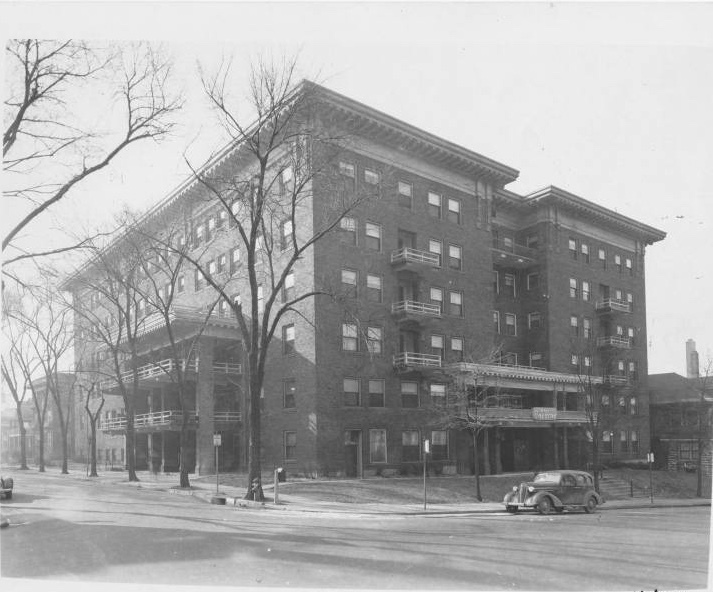 As part of our Uncovering History Project, the Midtown KC Post is taking a look at the 1940 tax assessment photos of each block in Midtown. This week we’re focusing on a block of Linwood to 33rd, from Campbell to Harrison. (Many people seem confused by the tax assessment photos, which all include a man holding a sign. Here’s the story behind them). A 1940 photo of the building, looking much the same. It was then known as the Lucerne Hotel. The building at 911 E. Linwood goes back to the early 20th century. The owners of the Belmont Hotel, which had been downtown at 303 W. 9th Street, bought the lot at the southwest corner of Linwood and Harrison from Congregation B’Nai Jehudah. W.A. Michaels also bought the adjoining lot, paying a total of $20,000 for a tract with 138 feet of frontage on Linwood and 2015 feet on Harrison. Sometime later the building became known as the Lucerne Hotel, as it was in 1949 when it was converted to a specialty hospital, Thornton Minor Hospital, which billed itself as “the oldest known institution specializing in the treatment of rectal and colonic troubles.” The hospital was founded in 1877 and claimed to have drawn patients from around the world. In a 1949 newspapers ad, Thornton Minor announced its move to Linwood and Harrison. 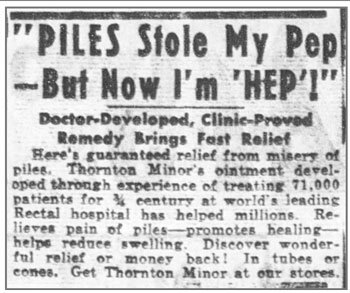 Thornton & Minor treated rectal and colon ailments including piles (hemorrhoids). Thornton & Minor converted the hotel into a 300-bed hospital. Patients had previously been forced to stay in hotels near its facilities. In 1957, Thornton & Minor moved to Excelsior Springs. The following year, the building became the regional office for the Veterans Administration. By the late 1960s it had again found a new use as the Mission East Nursing Home. Jackson County operated the facility until the mid 1970s when it transferred indigent patients to the Jackson County Public Hospital. And in 1977, the state briefly considered turning the building into a dormitory-style state prison, but that plan never materialized. Perhaps the most lavish home on the block stood at 3240 Harrison, appearing on an early map from 1897-1907. 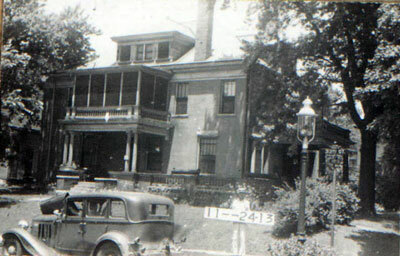 In 1910, the Charles J. Schmelzer family lived in the home. The J.F. Schmelzer and Sons Arms Company moved to Kansas City in 1885 and sold athletic goods, firearms, toys and children’s vehicles until 1928. That home later became a rooming house and in 1964, the owners were advertising furnished rooms for rent at $30. The home is no longer there. The rest of the block consisted of single-family homes, small hotels and apartments. The slideshow below shows the buildings as they looked in 1940. Most are still standing today, with a line of old homes lining Campbell Street (those marked 18-26 in the slideshow), along 33rd Street (numbered 14-17) and on Harrison (numbered 5-13). Do you have memories or more details about this area of Midtown? Please share them with our readers. Walt Bodine once told me that during the hospital’s tenure people called the building the “Cottontail Palace” because of the patients recovering from hemorrhoid surgery.